Colombo P., Lentini F., Gargano M. L., 2003. Micromorfologia fogliare di Bupleurum elatum e B. dianthifolium (Umbelliferae). Quaderni di Botanica Ambientale e Applicata, 14 : 125-133. Gianguzzi L., Cusimano D., Cuttonaro P., Ilardi V., 2011. Endangered plant species of Marettimo Island (Sicily, Italy). In: Fraga i Arguimbau P. et al. (eds. ), Book of Abstracts II Jornades de Botànica a Menorca: “Illes I plantes: conservació i coneixement de la flora a les illes de la Mediterrània” (Es Mercadal, Minorca, España, 26-30 abril 2011): 34-35. Gianguzzi L., Cuttonaro P., Cusimano D., Romano S., 2013. Bupleurum dianthifolium Guss. Informatore Botanico Italiano, 45 (1): 131-133. Cuttonaro, P., Gianguzzi, L. & Romano, S., 2011. Bupleurum dianthifolium. The IUCN Red List of Threatened Species 2006: e.T61609A1252128. http://dx.doi.org/10.2305/IUCN.UK.2011-1.RLTS.T61609A12521286.en. Gianguzzi L., Scuderi L., Pasta S. 2006. 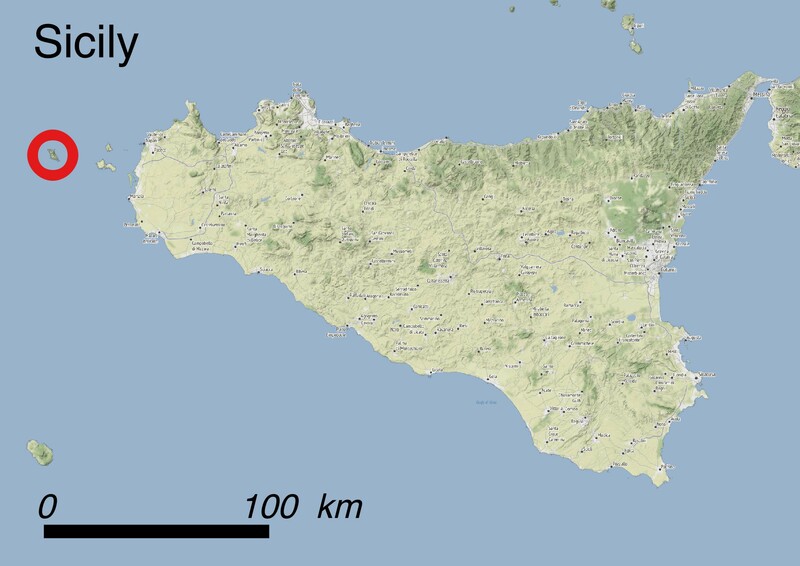 La flora vascolare dell’isola di Marettimo (Arcipelago delle Egadi, Sicilia occidentale): aggiornamento e analisi fitogeografica. Webbia, 61(2): 359-402. Neves S.S., Watson M.F., 2004. Phylogenetic relationships in Bupleurum (Apiaceae) based on nuclear ribosomal DNA ITS sequence data. Annals of Botany, 93: 379-398. Pasta S., Ientile R., Lo Cascio P., Giunti M., 2009. Aspetti Botanici, Ornitologici e Zoologici. In: D'Angeri F. & NEMO s.r.l. (eds.) Piano di Gestione “Isole Egadi” - POR Sicilia 2000/2006 - Codice Identificativo 1999.IT16.1PO.011/1.11/11.29/0297. Trapani, Provincia Regionale di Trapani. This plant is endemic to Marettimo, the westernmost island of the Egadi archipelago and of all Sicily. Approximately 300-500 individuals form ca.13 nuclei scattered over an EOO of 1.2 km2. The plants are mostly located on the north-facing calcareous cliffs (Habitat 13.1: Sea cliffs and Rocky Offshore Islands) of the island, between 20 and 600 m a.s.l., being able to colonize rock crevices thanks to their deep root system. The species is part of a chasmophilous plant community which is very rich in endemic plants such as Asperula rupestris, Dianthus rupicola subsp. rupicola, Glandora rosmarinifolia, Oncostema hughii, Pseudoscabiosa limonifolia, Seseli bocconei, etc. Frequent mists and regular dew probably play an important role as regular sources of water input. Bupleurum dianthifolium is a small, evergreen cushion-shaped shrub with below-ground regenerating buds. The leaves, crowded at the tip of almost leafless flowering stems up to 40 cm long, are linear-lanceolate (2.5-3 × 25-32 cm) and often sickle-shaped; the blade is also characterized by a revolute margin and 3-5 parallel veins. The compound inflorescences are small umbels with (3)4-6(8) rays. The species usually flowers between May and June and the seeds ripen during the following 2-3 months. Pollen vectors are flies, while fruit dispersal is balistochorous. B. dianthifolium is the easternmost representative of a group of isolated woody species scattered in the SW Mediterranean (Maghreb, South Iberian Peninsula) and Macaronesian islands. Along with its nearest relatives, B. fruticescens from NE Spain and B. barceloi, both confined to similar conservative habitats such as north-facing sea cliffs, it has to be considered a palaeoendemic species issuing from the evolution of a macrothermic ancestor which might have been more widespread in the past. Being restricted to a single habitat and as its scattered population is only present on an AOO of 12 km2, the species has been categorized as VU (Vulnerable) according to IUCN Red List criteria D1 + D2. In fact, no decline in EOO, AOO, extent or quality of habitat, number of locations, number of mature individuals, has been observed during the regular field surveys carried out during last ten years. Despite growing on almost inaccessible cliffs, its survival is threatened with wildfires (threat 7.1.1: Fire and fire suppression - Increase in fire frequency/intensity) and its spread is limited by overgrazing due to allochthonous herbivores (threat 8.1.2: Invasive non-native/alien species - Named species). In fact, the few mouflons introduced on the island ca. 40 years ago gave rise to a flock of ca. 200 individuals, able to feed in the steepest areas. Intentional gathering by botanists may also represent an underestimated problem to control (threat 5.2.1: Gathering terrestrial plants - Intentional use). Legally: This species is listed in Appendix I of the Bern Convention. In situ: The whole area of Marettimo Island is included within the Natura 2000 Special Area of Conservation (SAC) “Isola di Marettimo” (ITA010002). Ex situ: in the framework of the projects GENMEDOC (http://www.genmedoc.org) and SEMCLIMED (http://www.semclimed.org) seeds have been collected ca. ten years ago and stored in the seed banks of the Universities of Palermo and Catania. Plants are cultivated in the botanical gardens of Florence and Palermo. If a nature reserve was established on the island, all the conservation measures prescribed in the SAC management plan, such as the reduction of browsing pressure, the prevention of wildfires and the prohibition of plant gathering could be better applied. Prof. Lorenzo Gianguzzi, Dipartimento di Scienze Agrarie e Forestali, SAF, University of Palermo, Italy. Dr. Antonino La Mantia, PromoVerde Sicilia, Palermo, Italy.